Bookings made easy for your business with bookingkit. - We show you how it works. Get bookings directly on your website! bookingkit is a leading online booking and management software. Generate more revenue on the internet more easily, organize your administrative tasks better and get bookings online at any time. Whether online, mobile, offline, with sales representatives or on the phone - your guests can now make bookings as they like across all channels. Don't miss any customer again! Reduce no-shows, dynamically adjust your prices and save valuable time with our smart features. bookingkit helps you in your daily business – see how! Instantly enable online bookings for your business and accept payments online! bookingkit has everything you need! 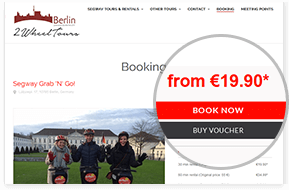 Your website will turn into a booking machine instantly - of course mobile ready! With a unique voucher function, available in 11 languages ​​and support for all major payment methods. bookingkit is your reliable booking solution and can be integrated into your website perfectly. Many easy-to-use features for quick and simple customer management! Make life easier – bookingkit is the smart software solution for your office. Many useful features take care of your business's entire administration and manage the processing of all bookings, cancellations and vouchers. All of this in a simple and beautiful interface, including statistics and more. Keep in contact with all of your customers – our software will help you during every step of the way. More time for your customers! Market your offers across all channels – but keep track of everything in ONE CENTRAL calendar. bookingkit connects and synchronizes you across various portals and puts you in control of all your booking channels. Ensure your capacities and prices on all sites are always be up to date with bookingkit! Acquire customers from major portals and synchronize your data! Our booking solution is made for your business – just select your industry. bookingkit as a technical service provider for processing bookings. Thanks to bookingkit, our customers don’t have to look on various market places to make online bookings. They can directly and securely pay on our website. In that way, we keep the traffic on our own homepage which now is our major sales item. We wanted to find a way to differentiate from our competitors. 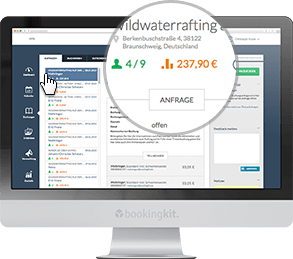 Since most spas do not provide their customers with online bookings and payments, bookingkit made it happen. For us, the integrated voucher selling system is particularly practical. Thanks to bookingkit, signing up for Secret Tours Berlin is just as easy as can be. Our customers can see exactly on which days and at which times we have spots open. This takes a huge organizational weight off our shoulders and frees up time for us to get the word out about our tours. Bookingkit enables us to further develop the rental of our boats. Due to the online booking, we raise the awareness of way more customers than before. Our utilized capacity increases. We also hope to further increase our efficiency with the interfaces to some leading portals which bookingkit offers. In collaboration with our partner bookingkit, we can offer an efficient software to our cooking schools. With bookingkit and its easy-to-handle administration, we can save a lot of time for our clients. That way, they can focus on their core business – cooking.